Ready To Launch…London Ahoy! – Run. Ride. Roam. 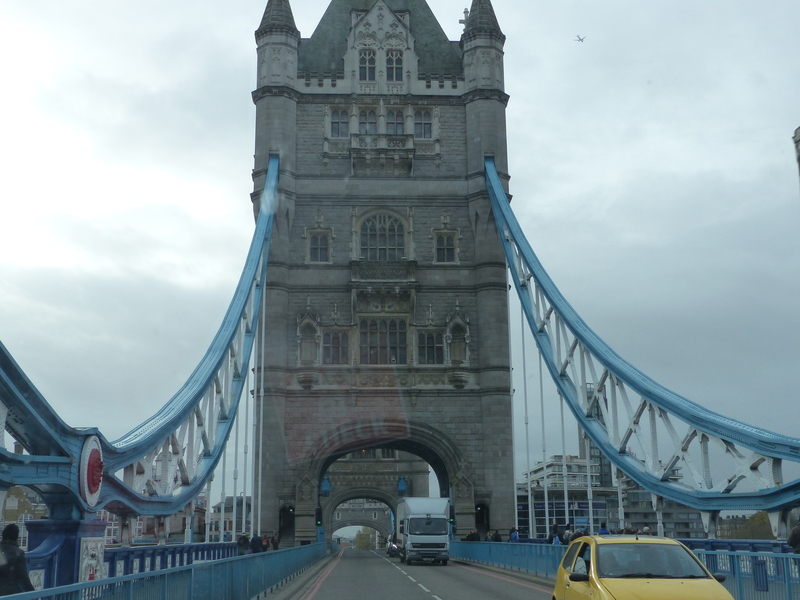 1.Make the maiden voyage of navigation, driving through the centre of London, to find our apartment at Canary Wharf. 2. Make the return voyage through the centre of London to return the vulgar van. Captain Steve took the helm again, with myself as First Officer beside him. “James” sat on the bridge, as Navigational Officer, guiding us through the choppy waters of traffic in the rapids of London streets. The Captain did a sterling job, steering the feral vessel along the motorway, around loop-the-loop exits, through the city streets, around trucks, past cabs and out the other end of the peak hour, to arrive at Canary Wharf. Champion driving Captain Steve! On arrival, we called the owner of the flat we’re staying in, who met us at the door a short time later, showed us around and then left us to unload. The vile van was unloaded and bit by bit, all the gear and the bikes were carted up the stairs and into the flat. We had arrived at Canary Wharf, unloaded and the van was ready to go again. Mission 1 ACCOMPLISHED! Captain Steve took the controls again and gave the orders to Navigational Officer James, to guide us to the offices of Wicked Vans, where we could finally hand over the rattle trap tin can. 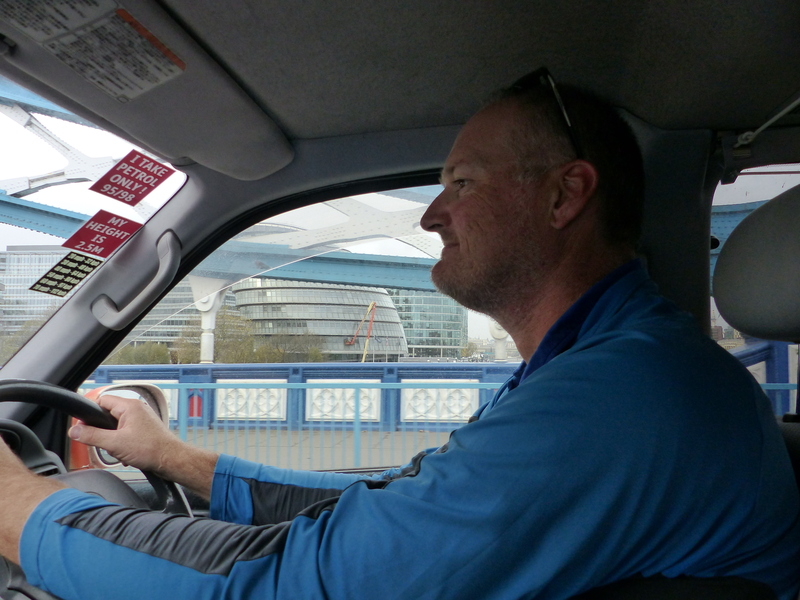 Captain Steve again steered the van admirably, through the streets, mingling with more black cabs, zipping through intersections and even over Tower Bridge. Not a wrong turn was made, not a honk from another driver was received and we found the drop-off location, through Elephant and Castle and out the back of Lambeth, under the railway arches. 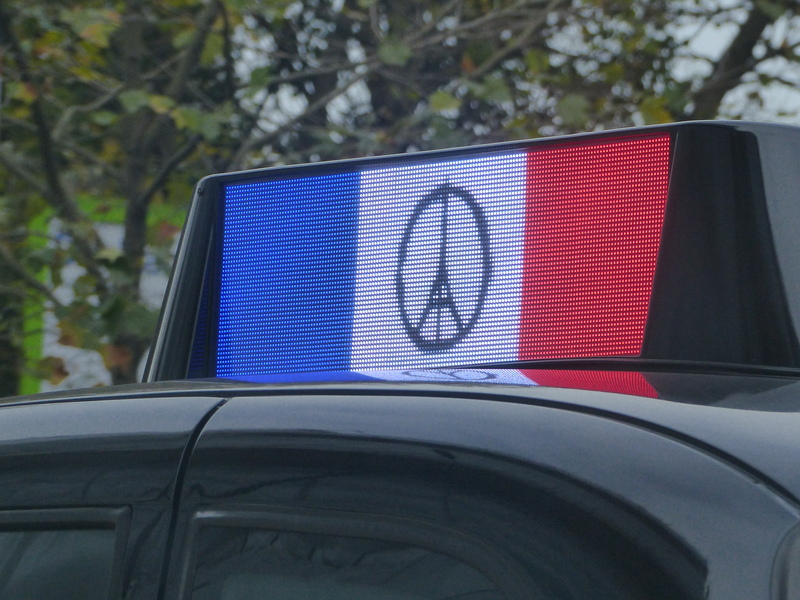 After making a phone call, someone eventually turned up to meet us, we handed over the van with a sigh of relief and we were finally free of that tank. Mission 2 ACCOMPLISHED! With the portion of the day involving wheels now over, our feet took over for some roaming. 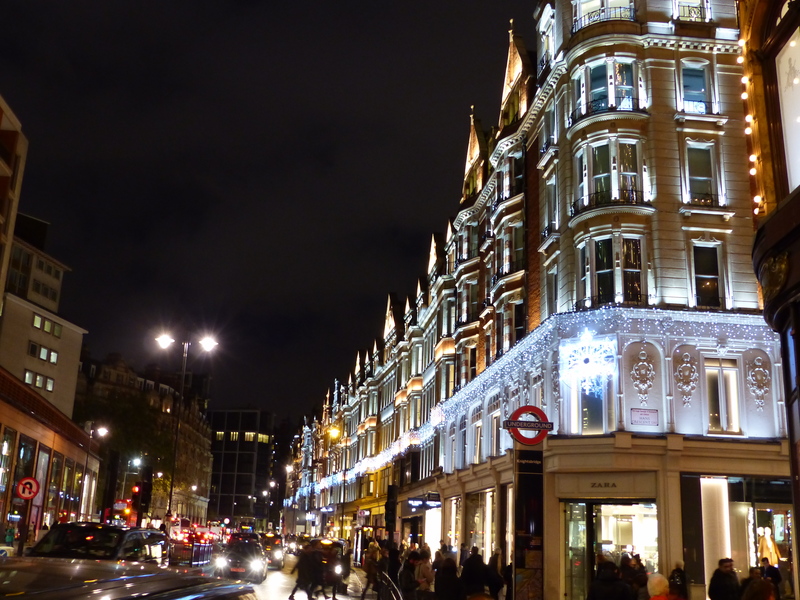 We took to the tube, to take a wander around Knightsbridge, where our arrival from the underground was greeted with pouring rain. A song came to mind…Meeeeemorieeeees, like the corners of my miiiiind…! Oh, that feels more like it! The rain had arrived, along with the wind and we had that feeling of deja vu! We strolled around, then walked with our umbrellas through posh Chelsea to a vegan cafe for lunch. We each had a raw dish, Steve the Pea Gnocchi and I had the Beetroot Risotto, which being raw, were each a little more like salads of shredded vegetables. They were both deeeelicious and were another example of the varied and new things we get to try when eating plant-based food. This was something neither of us had tried before or made ourselves and it was so, so tasty. 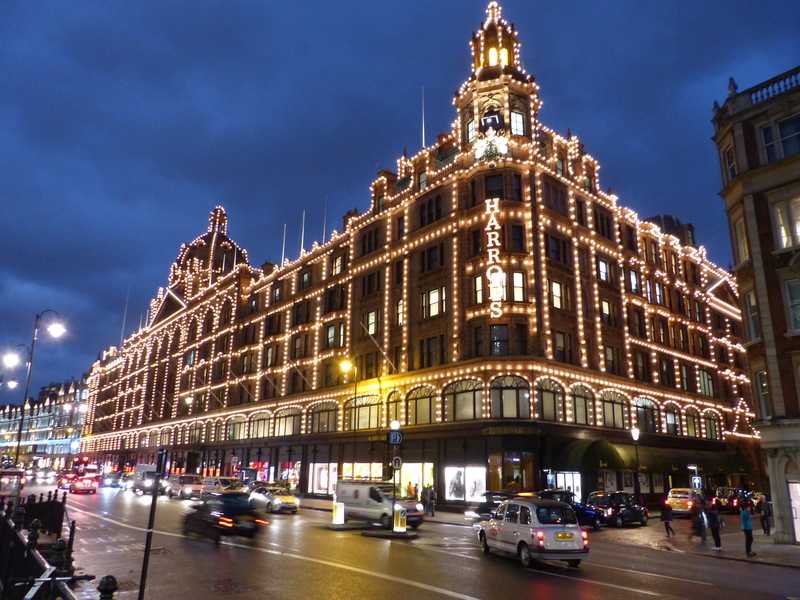 We strolled past Harrods’ Christmas windows and saw another Australian touch. 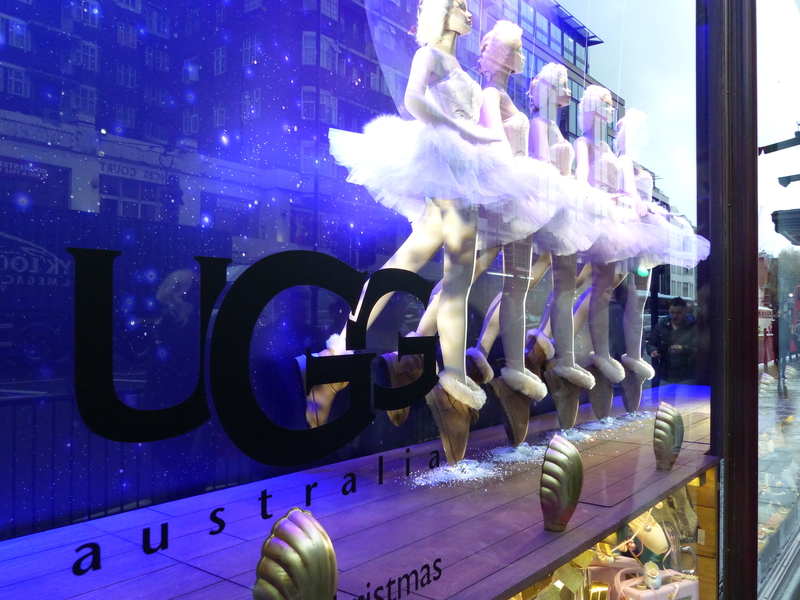 It seems Ugg Boots have taken a major step up from the standard bogan choice of footwear, because Ugg had their own Harrods window! 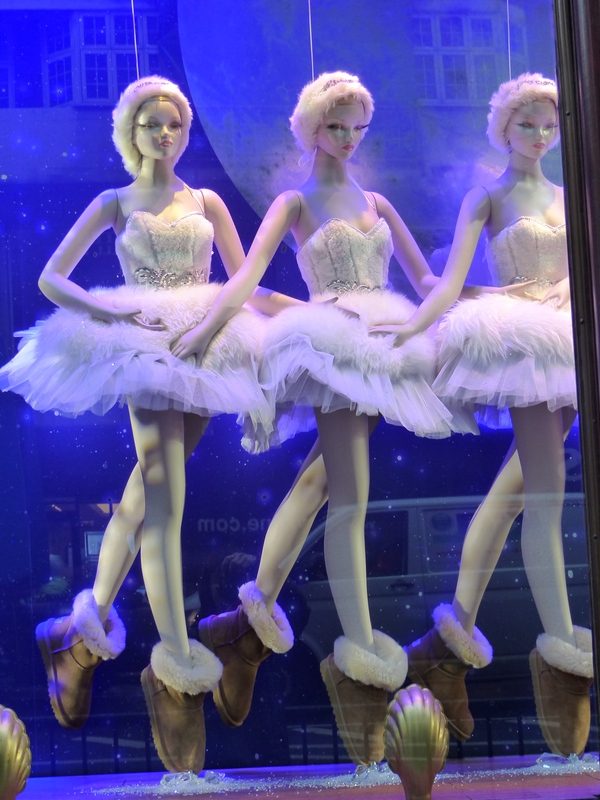 There they were, on the feet of a line of Swan Lake dancing ballerinas. Not a flannelette shirt to be seen! The scene of Harrods all lit up looked pretty special and we didn’t even have to wait long to see it because it was dark at 4:30 in the afternoon! It’s not even winter yet and the days are already so short and getting shorter. A very speccy sight at only 4:30 in the afternoon! Time to head back, so a sardine trip on the tube was taken and we arrived at Canary Wharf. Then a windy walk in the dark, through the financial hub and into the narrow lanes and streets of Coldharbour and we were back at the flat. We’ll be in London for a couple of days now. We didn’t really feel the love for this city the first time we were here, so we’ll give it a couple of days to redeem itself a bit, have another look around and do some more exploring. It already looks very similar to the first time…cold and wet and windy! The seasons may have changed but everything has stayed pretty much the same! No matter, we’ll rug up, get ready to roam and just enjoy being in England for the continuation of our adventure. We’ve got the brollies, we’ve got the coats and now…we’ve got the shoes! We’re ready to roam!